In the previous chapter we’ve covered how to write invoices: all the different elements invoices should include, the order in which these elements should appear on the invoice and so on. However, you shouldn’t have to start afresh every time you want to issue an invoice by opening a brand new document, writing all the required fields on it and filling them out. It’s much easier to create a template: then all you have to do each time you want to issue an invoice is fill it out with the relevant client’s order details. In the rare case where you receive a special request to send a different type of invoice, you can simply cut out the unnecessary elements, add new ones, move elements around and so on (take care not to erase the original template, though!). In this chapter we’ll discuss different types of temples and various programs on which you can create such templates. A table with the following headings: Item, Hours/Quantity, Rate (per hour/per unit), Tax and Subtotal. The table should include several empty rows in which you can write the items you’re billing; or simply have an option to add as many items as you want. The following image shows an invoice based on a template. This template is slightly different than the one described above, but the basics are the same. While the basics are always pretty similar in every type of invoice, there are several ways in which invoice templates could differ. 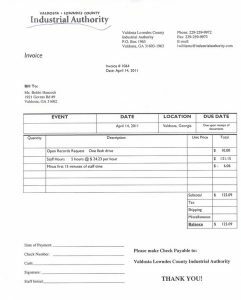 Type of invoice – The invoice template should match the type of invoice you want to issue. For a standard invoice, like the one used in most industries, the template detailed above would be just fine. However, a template for a commercial invoice will look different: such an invoice is used when products are crossing international borders, so it would include fields like the country of origin, country of destination, the carrier identification number, etc. The same goes for other types of invoices: different templates need to be created for a proforma invoice, a utility invoice, a debit memo, a timesheet and so on. Design – Invoice templates can differ from each other by their designs. For example, some businesses would prefer to feature their logo on the bottom or the side of the invoice instead of the top. While one business would stick to a basic, minimalistic design with no frills, another business could choose to make its invoices on-brand, using the brand colors, a special font, etc. Invoice elements – different businesses may choose to include different elements on the invoice, according to the type of business and the services/products it provides. While a therapist would use “hours” as the billable unit, a jewelry designer would probably use “units”. Many businesses that sell products often choose to add fields that describe the specific product sold, like “model”, “color”, “version” and so on. So how does one actually create invoice templates for their business? It’s quite simple, really – there are plenty of invoicing software solutions to choose from today, as well as websites you can create an invoice on quickly and easily. Some of these programs have to be purchased and downloaded to your computer; plus, you’d need a license number for using them. Other programs are completely free, or at least free for a trial period. Even simpler and more convenient are websites that provide you with a modular free invoice template with which you can create invoices tailored to your needs online and send them to your clients right away. These websites usually require you subscribe, but using them is free of charge (although some may require a yearly or monthly fee, but it is usually quite low).